You hear it all the time. Move to the Pacific Northwest, it’s great here! It sounds trite, but hey- west coast, best coast. I’ve been discovering this place my whole life and I think I’ve been to some places that aren’t traditionally included in the “PNW is best” campaign. I’m going to start with eight and hopefully add on as time allows. These are in no particular order of importance. There’s no rhyme or reason. 1. 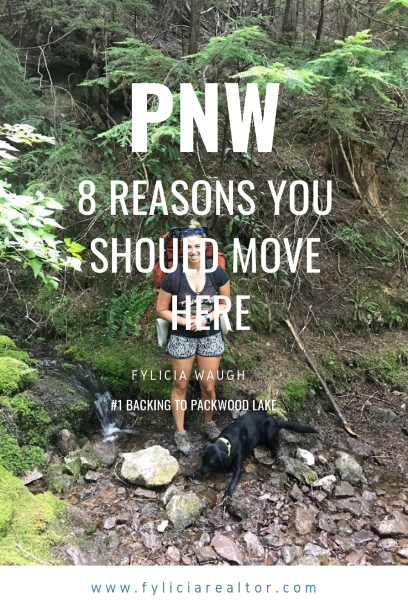 I’m going to begin with back packing to Packwood Lake. We ventured out to this gorgeous lake a couple summers ago. Absolutely stunning, I wish I had more photos to share, you’ll have to google it! It was a pretty lengthy hike for me, since it was my first-time backpacking, but it was well worth it. If you decide to venture out to Packwood, their pizza place is the BOMB! Highly recommend it! Also, at the actual lake, if you just keep walking there are a number of lakefront camp spots. I’d recommend bringing a floaty and fishing poles along too! 2. 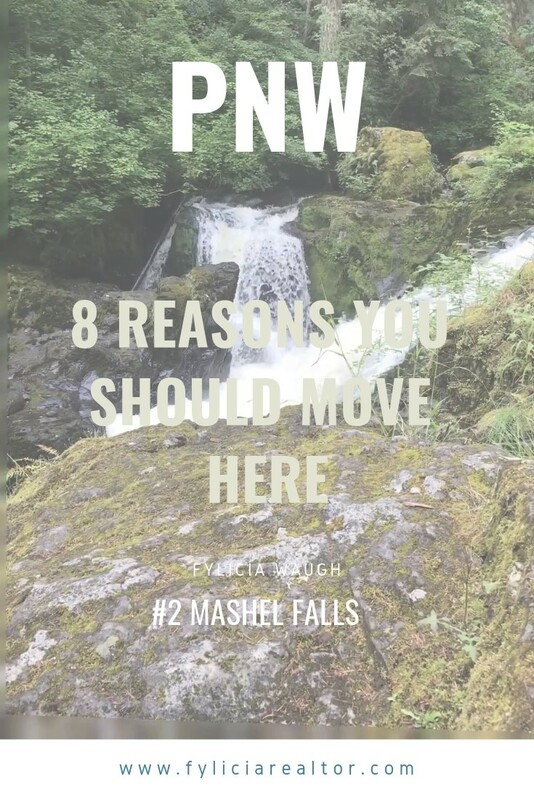 The second place is Mashel Falls, which is near and dear to my heart. 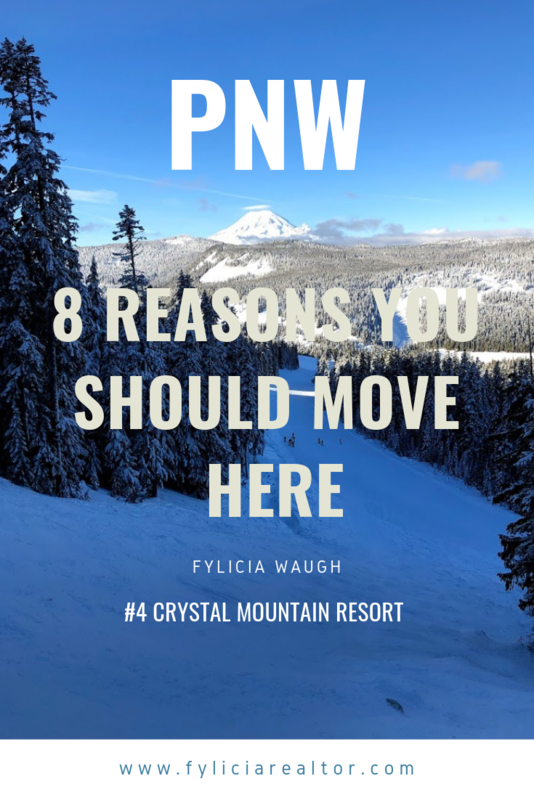 As a kid we grew up in Puyallup, back then South Hill and Graham weren’t developed as much so driving out to Eatonville felt like a jaunt, an escape, a getaway. We hiked to the waterfall many times. Now that I live out here in Eatonville it’s a regular day hike for us in the summer. Use extreme caution if you hike this in the spring. It is very dangerous- muddy and slippery rocks. It’s absolutely beautiful, breath-taking. A true must see! 3. Next is Riffe Lake. This lake is HUGE to me! It’s outside of Morton. We cruised around on it in a small fishing boat. Did a bit of fishing, not bad. There are tons of awesome beaches, alcoves and rocks to jump off. There’s an official camp ground too. However if you have a boat, canoe or kayak I highly recommend taking a toot around the lake and finding a secluded sandy oasis of your own. 4. Fourth is Crystal Mountain. A popular location, I’m sure. The skiing and snowboarding here is terrific and the views are phenomenal! If you can visit on a clear day with blue skies, there’s just not much better. Especially with some fresh powder!! 5. 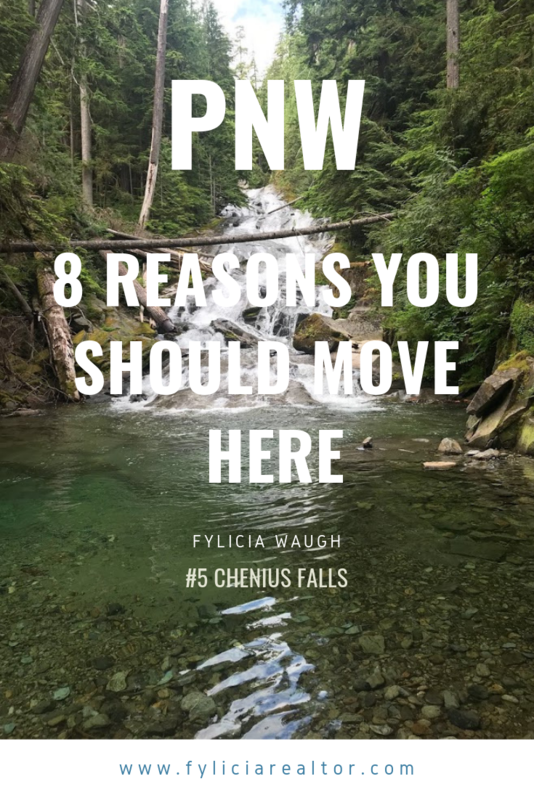 Number five is Chenius falls. Now I KNOW this one is NOT popular. It couldn’t be. To get to this majestic waterfall you’ll have to hike 5 miles one way on a dirt road, or PRO TIP- bring a bicycle! That’s what we’re doing next time. The waterfall itself is wonderful and the little pool below it is even better, so crystal clear! I wish we would’ve went on a hot day so we could’ve swam. That water is COLD though, straight glacier run off. This is right near the carbon glacier. 6. The sixth is Glacier View Trail. Wowza! Let me tell you, this one takes a bit of effort, but 100% worth it. My photos cannot do it justice at all. You get to see Mt. Rainier and Adams. If you can hike this on a clear day- it will BLOW your MIND. To get there take the first left hand turn onto the gravel road as you leave Ashford. You’ll need to drive up this retched gravel road for about 8 miles. Just keep driving. The glacier view trail is at the end of the road and you go to the left. They’re not marked the best, that’s why I’m explaining. There are a couple other places you can end up if you go right. Gobbler’s Knob/Lake George Trail and Goat Lake. Those are really pretty too, but totally different scenery. It’s more meadows with lakes surrounded by evergreens and foothills. As a side note, if you don’t have the all trails app, I recommend it. The Glacier View Trail is only 4 miles out and back and since it’s not in the park, it’s dog friendly. It has a 1,272 foot elevation gain, most of which is in the last quarter mile that’s very steep, but you HAVE to make it if you’ve went that far. The view is to die for! Definitely be cautious about going up this gravel road too soon in the hiking season, it has a lot of snow. 7. Eatonville sunrises (and sunsets). Oooo and ah. I mean it people. The mountain is BAMB right there, in your face. Again, my photos don’t do it justice. We have some pretty interesting cloud formations here. With the combo of the sunrise, clouds and mountains, it’s a sight to be seen and astonished by. 8. Last, but certainly not least. Fetch at Dash Point. That’s our adorable black lab Bonney. She’s full of excitement and energy. Fetch is life. If you add fetch and water- well you’ve made her day!! 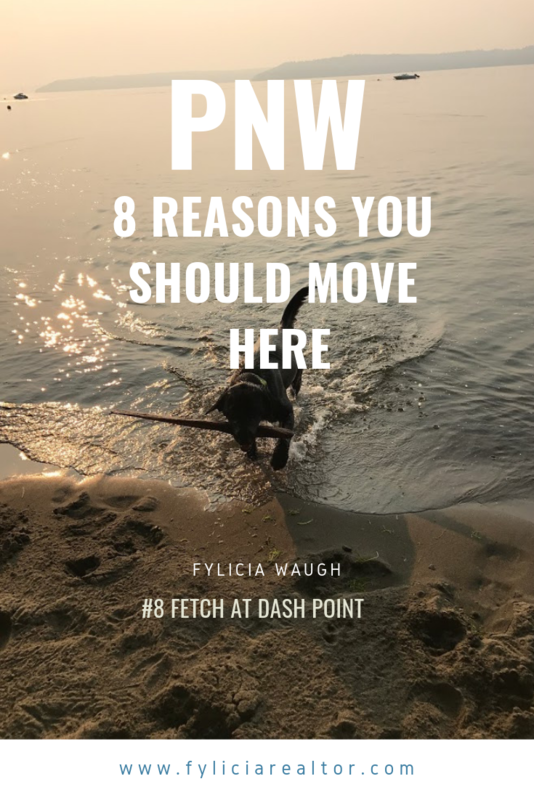 When my husband and I we’re dating he used to rent in the Dash Point area and we would walk her down to the beach and let her run wild and throw sticks. The sunsets there are lovely and it’s actually a sandy beach, unlike most rocky beaches here. Often you can see blue herring here too, which is neat. We like to collect sand dollars from time to time or jump and make the gooey ducks quirt water at us. I hope you’ve enjoyed my narrative on some of these awesome places. 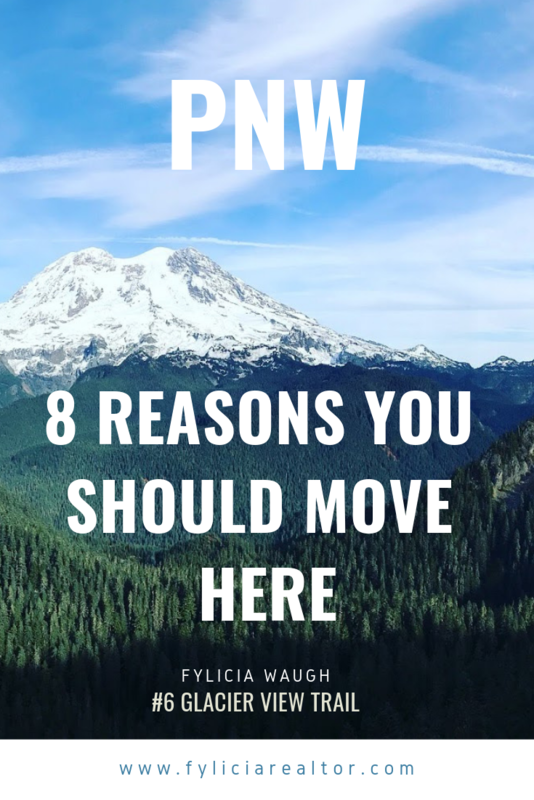 As you can see there’s a lot of reasons to love the Pacific Northwest AND move here! 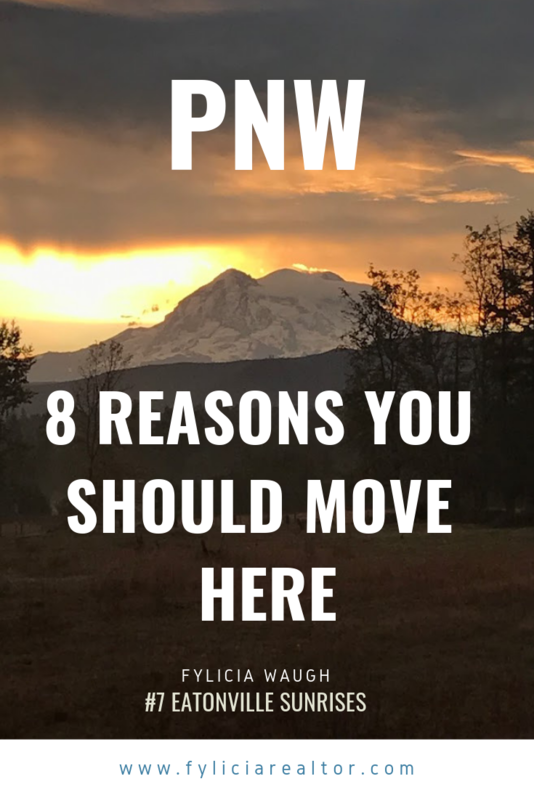 If you’re interested in buying OR selling real estate in the greater Pierce and Lewis County areas, please reach out to me, your hometown realtor. What are two your favorite places? Are you going to check out any of my 8? Where do you live now and where do you want to live?